Maybe it is a tad postmodern, or at least disorienting, to post-date this new review article written in January 2009 and publish it back on the November 2008 Monthly Column spot. Call me compulsive—it won’t be the first time—but I just wanted to have a space for a larger reflection, and finish off the (not so regular) columns. So to find today’s blog posting, check out that review. 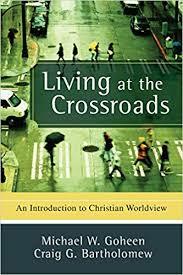 Please jump over to the website monthly column and see my ruminations on why we are so eager to promote the book I announced in the last post, Living at the Crossroads: An Introduction to Christian Worldview by Michael Goheen & Craig Bartholomew (Baker; $19.99.) I reflect a bit on what we mean by “a Christian worldview” and why it is so important. More importantly, I tell why Mr. Goheen and Mr. Bartholomew are so able and helpful guides into this topic, and how they explain it all within the social context of modernity and postmodernity. We live in intersting, some say, epoch-changing times. Christians of serious faith must live out their discipleship in all areas of life, in the times in which we find ourselves. This book will help churches make disciples, helping us all live well, with coherence, integration and relevant fidelity. Enjoy the review. “This book means to put genuine life back into worldview studies. tells it like it really is, for life, the universe, and everything. stark choice that Christians need to make. Which story do we live by?